What is the meaning of “Ganpati Bappa Morya”? I heard this many times but don't know what it means. Is Ganpati another name for Ganesha? What is bappa and Morya? Regard less of true story of Moraya Gosavi, that doesn't make anysense to say "Ganpati Bappa Moraya"... Actually splitting the word Moraya as "Mhora ya" means "come ahead and bless us" make sense here. Morya Gosavi was a prominent saint and the greatest devotee of Lord Ganesha. Morya is associated with the name of lord Ganapati as veneration to this great devotee. 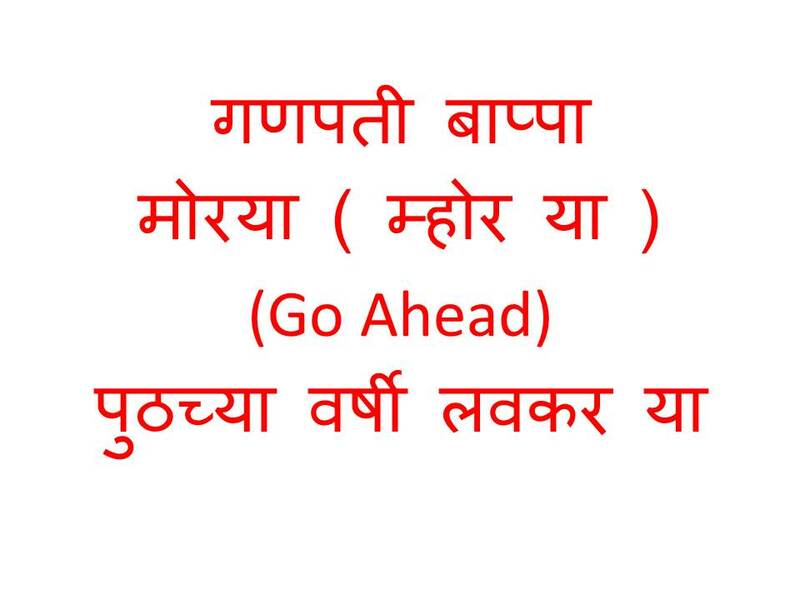 It is considered as a chant but have some Marathi meaning you need to consider. Yes, Ganapathi is another name of Lord Ganesha which means the Lord/Owner of all Shiva Gana (The army of Lord Shiva). Bappa means Father/Lord and Morya refers to the greatest devotee of Lord Ganesha. To understand the meaning completely, "Ganapathi Bappa Morya" alone is not sufficient. The entire stanza "Ganapathi Bappa Morya, Purchya Varshi Laukar ya" is needed, which means "O Lord/Father Ganesha, come again next year fast". Not the answer you're looking for? Browse other questions tagged ganesha festivals . Why we do not keep Tulsi on Prasada offered to lord Ganpati? When was Lord Ganpati Discovered? Who is the descendant of Bhrigu who heard the famous Vakratunda mantra to Ganesha from the gods? Why is Rig Veda Book 2 Hymn 23 Verse 1 not used for summoning or praying to ganpati? Did Lord Vishnu pray to Lord Ganesha? If yes, in which scripture is it written? Which scriptures portray Lord Ganesha to be the supreme God?